As a Pain-Free Movement Specialist, you will better understand how pain affects movement and how to create new strategies to help people move without pain. Get Anthony Carey's FREE eBook that has helped thousands of fitness professionals around the world. 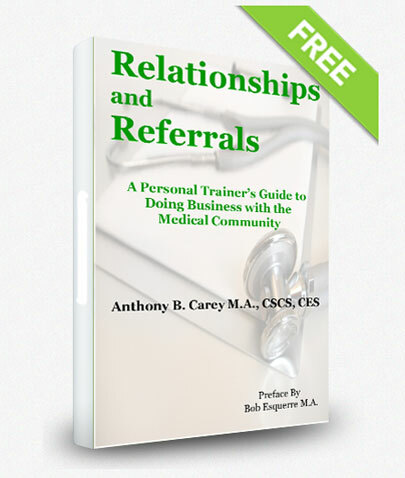 Start tapping into medical referrals to grow your business TODAY! Jorge L. Artaud,CPT,CES Condado, Puerto Rico "This 3-day mentorship has been a benefit in many aspects in my life. The quality of education I received, the vital information and resources I got through Anthony is a priceless growth for me and my business. Now I can plan and assess better my client’s routine, specifically to achieve better alignment and function of their bodies with no pain or ease the pain and eventually become pain free. Thanks again Anthony and Function First." DeRahn Johnson ACE-CPT, CES San Diego, CA "The 3-day mentorship with Anthony Carey has been without a doubt,the highlight of my fitness career. The mentorship completely reshaped the way I view and implement corrective exercise. I am still amazed at how much knowledge exists within the team at Function First in San Diego. If you are serious about taking your career to the next level, you MUST take advantage of this opportunity." Kevin Murray CPT, CES, PES Edmonton, Alberta, Canada "This 3-day mentorship is a must for anyone who is passionate about helping others who suffer from muscular-skeletal pain, become pain free. Anthony has given me the keys to what real Corrective Exercise is all about: Improving your clients’ quality of life TODAY, not 3 months down the road! I am forever grateful to Anthony and Function First." Jon Yuzwenko Edmonton, Alberta, Canada "My experience at the mentorship with Anthony was nothing less than mind blowing. It literally transformed the way we do business and had a profound impact on me as a Personal Trainer and individual. If you want to excel in the field of corrective exercise and haven’t adopted the function first approach then your clients are missing out on huge results. It was the best educational investment of my 7 year career and if the opportunity presented itself again I would be back in San Diego in a heartbeat." Learning corrective exercise along with the skills to work with people in pain gives you the opportunity to expand your business. It enables you to specialize in a variety of growing populations, including baby boomers, seniors, post-rehab clients and other special populations with musculoskeletal issues. You’ll be qualified to help more people eliminate their pain and improve their level of function, health and wellness using the most effective, non-invasive method possible. The Pain-Free Movement Specialist curriculum is the culmination of 20 years of using the Function First Approach to help those in pain to feel better, move better, and live more productive lives doing the things they enjoy. This is not a program to treat, diagnose or otherwise provide medical intervention. Strategic exercise programing is the vehicle used along with respect and consideration of the many factors associated with the pain Neuromatrix. The online curriculum is required to be eligible to attend our live events and provides the foundational background knowledge necessary to further enhance your programming and skill set with increasingly more challenging client scenarios. This online curriculum has been specifically designed for those who understand that personal fulfillment comes from servicing those in need, but may not have the proper insights and tools to work with individuals in pain. Level 1 has six modules, all of which are the foundation that the Pain-Free Movement Specialist (PFMS) stands on. With over 14 hours of video content, webinars, PDF's and Anthony's book, The Pain-Free Program: A Proven Method to Relieve Back, Neck, Shoulder and Joint Pain - this online curriculum fully prepares you for the content associated with the Level 2 live event. The purpose behind the online environment is to offer a comprehensive platform and reveal the powerful elements behind what makes the Function First Approach so effective. Through this deep and immersive program, you will discover that the critical forces behind Corrective Exercise prosperity lies in understanding the interdependencies of the body as it functions as a whole. Join us as we elaborately shed insight on how seemingly microscopic changes through the implementation of decisive corrective exercises can create profound improvements in your clients, patients and athletes’ lives. Our mission is to provide you, the movement or manual therapist, the corrective exercise intelligence and movement based strategies required for creating lasting change. Now that you’ve been introduced to the foundational principles, insights and strategies during the online portion of this curriculum, you’re now ready to step into level 2. Here you’ll discover first hand what goes into the assessment process, how to interpret the results, and how to implement powerful corrective strategies that can create immediate and lasting results. Determining which exercises or move­ments are best for a client’s neuro-myofascial-skeletal health begins with an assessment. Why does the assessment come first? No exercise is ‘functional’ for everyone; and the assessment is only of value if the principles of movement and function are understood. Functional anatomy, biomechanics, motor control, pain neuroscience, stability and mobility are all at play during movement, and an assessment provides insight into an individual’s capacity to move safely and effectively. Once the information has been gathered, designing and implementing a corrective exercise program follows. The power behind the Function First Approach comes from the understanding that syntax equals meaning, and the sequence in which the exercises are laid out is critical to a successful intervention. Each exercise should build from the previous, creating an environment where the neurological, physiological and biomechanical systems are exposed to new and novel synergies where an upgrade to the client’s movement blueprint occurs. Once this process takes place, the body is no longer able to function the way it once did. Each Level 1 Pain-Free Movement Specialist will understand how biomechanical principles and functional anatomy relate to upright posture, and how 3-Dimensional movement corresponds with corrective exercise. How the principles of fascia and plasticity relate to movement impairments and efficient whole body movement. How motor control deficiencies’ play a significant role in movement compensations and limitations, and how the nervous system responds to specific corrective exercises. Interpret the assessment data, establish precise objectives & outcomes, and design individualized corrective exercise programs with precision and confidence. Learn the acute variables behind numerous corrective exercise strategies and outcomes to design effective programs. Understanding that repetition is the mother of skill, level 2 provides a platform into an environment where mastering the assessment process and corrective exercise programming becomes a reality. By the end of the two days, each Pain-Free Movement Specialist will be proficient in the process of assessment and sequenced program design, and will leave with the confidence and competence to create lasting change with any chronic pain client. Elite Pain-Free Movement Specialists demonstrate a remarkable passion for servicing those in need. Seeing first hand individuals’ and their pain transcend into a brand new quality of life where pain is no longer the driving force is positively addicting. This mentorship is geared primarily towards working with the special populations demographic. Extraordinary attention and considerations are required when working with this population. Many have limiting biological, psychological and sociological constraints, coupled with biomechanical impairments that ultimately manifest as pain. Establishing an environment where each client is provided a blank canvas with the sole purpose of re-writing his or her movement blueprint through the power of corrective exercise is what this immersive, 3-Day live event is designed to achieve. Additionally, level 3 dives deep into a select number of advanced assessments, followed by the interpretation process. Many times, the current biomechanical state of the special populations clientele does not allow for the global movement assessments previously covered in level 2. A joint-by-joint analysis of the interplay between various body segments & how specific pathologies can negatively affect whole body movement will be thoroughly covered. How joint integrity and the corresponding functional anatomy and motor control may be altered due to various surgical interventions and/or genetic pre-dispositions and how to provided a comprehensive corrective exercise program will also be of high priority throughout the 24 hours of learning. Lastly, level 3 provides insight into how to market your current brand, and how to work with other medical & special population industries to better serve the chronic pain population. Each Pain-Free Movement Specialist will understand how various surgical interventions and genetic pre-dispositions affect’s function and movement. Introduced to basic gait assessment principles and how they correlate with the other assessments. The ability to express in written or verbal form, the mechanisms behind the neuro-myofascial-skeletal responses to the exercises. You’ll be given guidance on how to build rapport and business relationships within the medical, rehabilitation and fitness communities, and how to synergistically add value in a collaborative network. Level 3 provides each PFMS the opportunity to create the abundant future which all chronic pain suffers’ ultimately desire by assimilating the skills and expertise necessary to meet the complex needs associated with the special populations demographic. Autonomy creates an environment where we live life on our unique terms. Unfortunately, chronic pain suffers have all but forgotten the joy and flow that comes with the freedom of pain free living. Coupled with an individuals’ path to pain is a story of how his or her pain has negatively impacted their lives. What happens when the psychology and meaning driving an individual’s story becomes empowering? Or when a neuro-tag in a specific context facilitates a belief where suffering from chronic pain has its advantages? One of the secrets behind creating lasting change is first understanding that various human needs can be met through experiencing pain, whether it’s pain emerging from biomechanical limitations, or more psychological in nature. Make no mistake - pain is a subjective experience, and very often an individual garners a great deal of attention and significance from his or her pain. What is then required to create lasting change goes far beyond the optics of a purely biomechanical perspective. In Level 4, you’ll be introduced to various principles and strategies behind recognizing the precise patterns that are controlling many of your clients’ thoughts, feelings and emotions, many of which negatively impact movement, further enhancing pain. From the client centered interviewing process, understanding Human Needs Psychology®, becoming cognizant of the biopyschosocial model in relation to pain, to ultimately guiding the process of each clients’ self-discover that a life driven by autonomy and pain free movement IS possible, & within his or her own reach. Accompanying the 3-Day Mastery Academy are the 5 Core Business Concepts, that once modeled, can lead any manual or movement practitioner to thrive in the corrective exercise industry. Recognize the business you’re currently servicing, & how to consciously design a powerful blueprint that will guide you towards your ultimate vision. Decipher what your natural leadership style is, & how to build your team based around the needs of the business. Discover the values and purpose driving your operational decision-making process, & how/when to implement change. Learn the secrets to broadening your client base by discovering the unique X-Factor behind your business. Identify which primary principles are required for innovation, marketing and communications success best suited for your current business needs and desired outcomes. Each Pain-Free Movement Specialist will be introduced to the client centered interviewing process designed specifically for working with the chronic pain population. Learn the principles behind “Human Needs Psychology®” and its impact on identity, pain & movement. Assimilate how the Biopsychosocial Model applies to the chronic pain demographic, & uncover dynamic strategies to immediately resolve & reframe any clients’ self imposed limitations. Uncover the 5 Core Business Concepts for consistent industry prosperity & the skills necessary to build your unique company brand. Recognize how to turn your unique business identity & brand into a first class customer experience, resulting in repeat customers & consistent referrals. Observe, practice and apply the principles & strategies with fellow PFMS, on your way to obtaining your Function First Mastery Certificate. Function First Mastery requires precision, distinct strategies and crystal clear objectives. It’s a pledge to settle for nothing less than remarkable achievements in the most meaningful areas of business & professional development. Mastery is unwavering perseverance to do whatever it takes, and the know how to change your approach if needed. It’s about creating consistent breakthroughs, extraordinary results, and always finding a way to serve the best interest of the client, athlete or patient. Function First Mastery is a total immersion into truly mastering all aspects of The Function First Approach today, and any future evolutions scientific research and practical applications provide. If your educational qualification is not listed below and you wish to have it considered for the Bridging track, please contact us with the necessary supportive information. Follow us on the Social Networks to learn about our upcoming events! © 2015 Function First. All right reserved.